429, Lot: 319. Closing Sep 26, 2018 at 11:46:20 AM ET. Gaius (Caligula). AD 37-41. Æ Quadrans (18mm, 3.46 g, 6h). Rome mint. 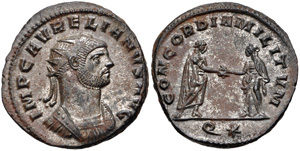 Struck AD 39. 429, Lot: 351. Closing Sep 26, 2018 at 11:57:00 AM ET. Philip I. AD 244-249. AR Antoninianus (21.5mm, 3.45 g, 12h). 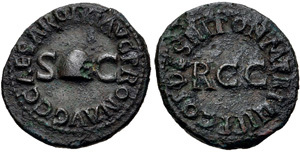 Rome mint, 2nd officina. 5th emission, AD 246. 429, Lot: 357. Closing Sep 26, 2018 at 11:59:00 AM ET. Aurelian. AD 270-275. Antoninianus (20mm, 4.24 g, 6h). Siscia mint, 4th officina. 7th emission, AD 274. 429, Lot: 361. Closing Sep 26, 2018 at 12:00:20 PM ET. Diocletian. AD 284-305. Æ Follis (27.3mm, 9.49 g, 6h). Aquileia mint, 1st officina. Struck circa AD 296.